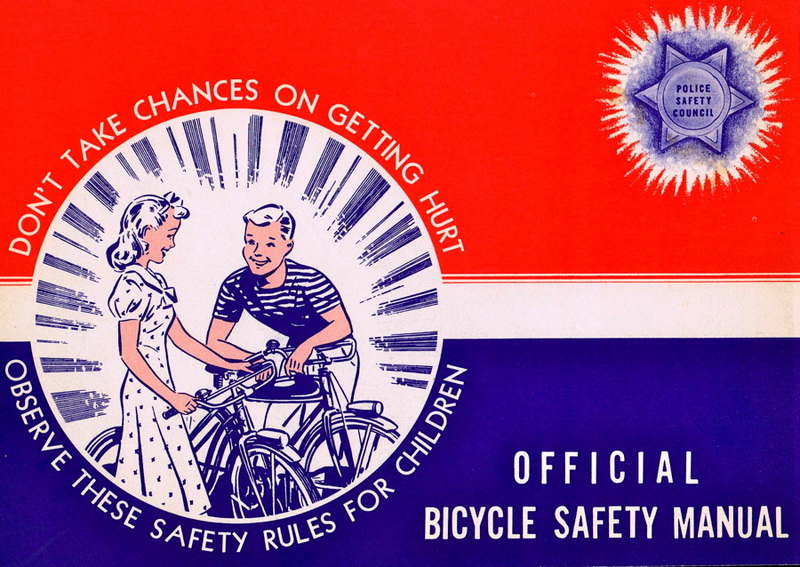 Apparently these graphics come from a Bicycle Safety booklet that was distributed to elementary school children back in the 1950’s or 1960’s. It boggles my mind. While I am typically not an advocate of re-blogging, reposting material from other people, I’ve been captivated, fascinated (?!) by a set of scanned images posted by one of my Flickr contacts (samhDOTnet) and felt the need to share. The propaganda – the illustrations and accompanying captions – are nothing short of … crazy, terrible, horrific, mind-numbing, innapropriate, and countless other adjectives that I won’t list. As a child of the 60’s, I remember some crazy stuff from back in the day in elementary school (a booklet I had as a school “safety patrol” crossing guard comes to mind) – but nothing quite like this. Most of all, it makes me contemplate the evolution of attitudes towards cyclists vs. “the rest” (cars, trucks, rights to roadways, even pedestrians), not to mention the image some people continue to have of people on bikes. And the fact that culpability for cycling fatalities and accidents in this country – for as long as we’ve been sharing the road – is often not well investigated and blame still seems to be placed on the cyclist rather than the driver of the motor vehicle more often than not. It’s a little hard to think about, really. The entire set can be seen here (if you want to hurt your eyeballs), in his Set titled “A RIde of Death”. It does make the halcyon days of my youth seem less ideal. Wow!!! That is amazing! Almost like the script was storylined from many of the illustrations ion the booklet – along with a healthy dose of Planet of the Apes. Good grief. The fact that the one kid who obeys all of the Rules gets “too fat” is fits right in with the level of crazy. Thank you for sharing! Seriously? I can’t believe this was given to kids to promote safety. I wonder how it worked…probably not that well, I would say. And if you ever wonder about our generation being screwed up, now you know why … lol. The “accompanying” video from Vannevar (http://www.youtube.com/watch?v=cQgAMkMmsfg&feature=youtube_gdata_player) basically puts the booklet on film, with an added touch of mask-wearing by bicycle – because it’s safer than wearing a helmet? And as one video comment put it: “Watch your friends die, eat their food.” Insane. Because we also used to ride around wearing paper mache monkey masks, looking for death (lol). With the lovely moral of the story being: follow the rules of the road, and you can be the “one (who) got fat”. I’m doing the Habitat ride, “Bike to Build” on 4/21…..what time of day are you thinking about? Very disturbing. It’s good thing that propaganda wouldn’tt fly in today’s world. Love it! 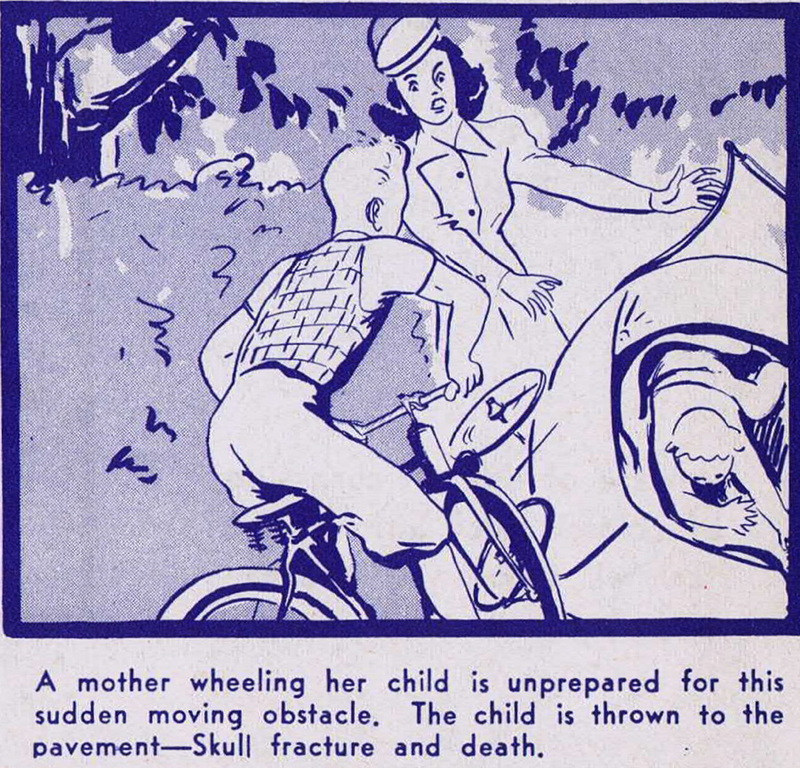 Nothing says feel good like an infant skull fracture. 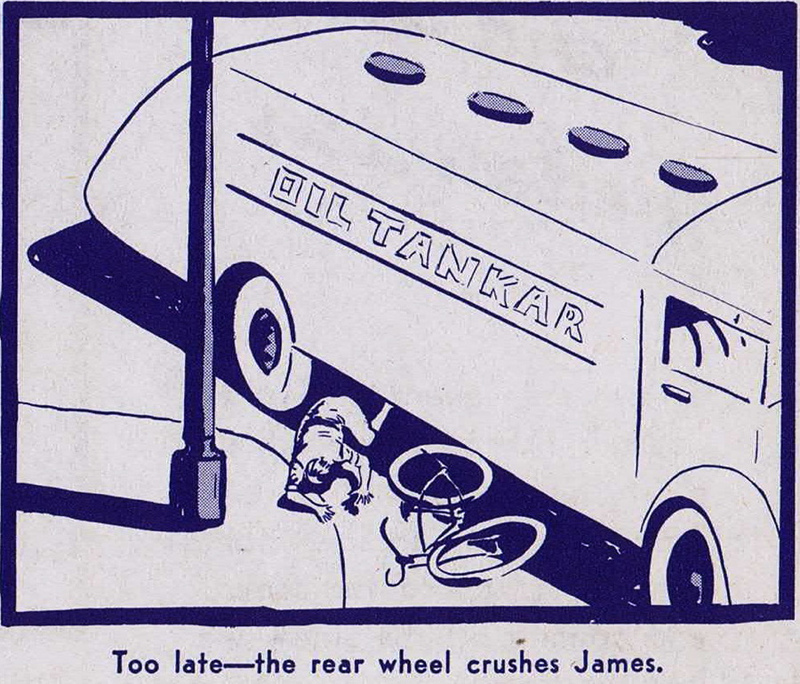 The fact that oil tanker is spelled wrong and made it into publication is awesome, too! Ahhh! 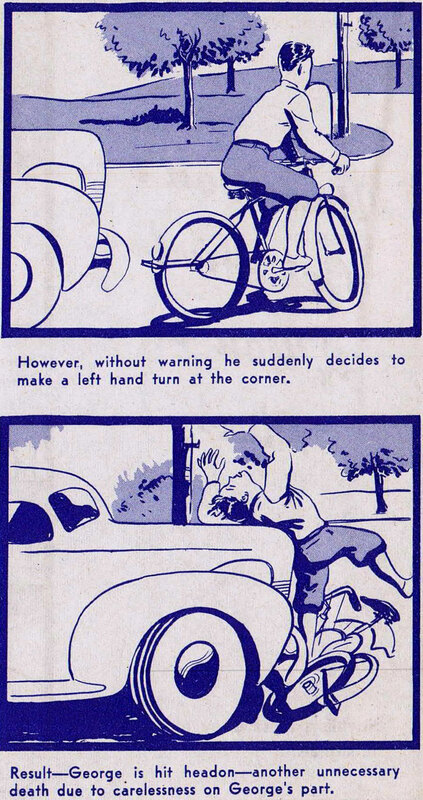 They might as well have written: We think cyclists are imbeciles! It’s absurd! So un pc now! No sensitivity! You are right when you mention that this could have something to do with the modern attitudes toward cyclists. I wonder how many people read this when they were children and went to bed at night terrified of some kid on a bike.